Statistics are available in many games to affect game play. In Onigiri Online, there are five primary stats, followed with eight secondary stats that are affected by the primary ones. There are also elemental affinities and weapon proficiencies which are affected differently than the secondary stats are. There are many methods the player can use to gain experience. The most common methods of gaining experience consists of completing quests and killing monsters . Quest completion always provides a set amount of experience points and other benefits to the player depending on the quest. Monster experience is determined based on the player's level in relation to the level and type of the monster killed. The experience points that the player gains determines the level of their character. As he or she levels up more and more, the required amount of experience gradually increases. Status points are used by players to increase their five main stats: Power, Vitality, Wisdom, Mind, and Dexterity. Status points are typically gained upon level up, but may be obtained from elsewhere such as a quest or through friendship levels with Amaterasu . As the player levels up, the amount of points they obtain per level tends to increase. Every tenth level the player gains bonus points in addition to their regular points. This link contains raw data on experience and status points per level. Once the data is complete, this text will be replaced with a table containing simplified data. Please be patient. Onigiri Online follows the "Status Carry" method of levelling, where stat points are granted to the player and the player has the option of which primary stat to invest the points into. They also have the option to hold onto the points and invest them later instead. While at lower levels, the stat points per level given is low, but as the player reaches higher levels, the player receives more per level. This though is because the amount of stat points required to increase a primary stat by one also increases as they reach higher and higher. For example, when all stats are below 20, all of them will cost 3 stat points. But by the time they reach 50, they will require as much as 6. Also, at every 10 levels, the player will receive a small bulk of bonus points. Some information in this table is inaccurate. We are working on updating it, but until then here is a compilation of information we have. - 1 P.Atk Spd per 12 points. - HP recovery 0.25 per point. - 0.5 HP recovery per point. - Give 6 - 8 P. def and scale up each (8, 18, 28, ..., 78) point as 34 + 6.5 * (1 to 8) P.def depend on the scaling level above per Vit point. - 1 - 3 of M.Def per point. Most effective Magic cast speed, Sp recovery and Reduce M weapon skill Sp cost - Give 4 - 6 SP per 2 point. - Give 2 - 4 SP recovery per point (cap at 500). - C$ ??? M.Cast Spd per 8 Points. - 1 Critical per 24 points. - Give 3 - 5 SP per point. - Give 1 SP recovery per point. - Give 1 - 3 P.Def per Point. - Give 6 - 8 M.Def per point. - Staff skill need a certain amount of Mnd to use. - Give 1 Cooldown Time Reduction per 24 point. Most effective Cooldown Cut and Critical - Give 1 Critical per 12 points. - Give 1 Cooldown Cut per 12 point. Power, or in otherwords strength, is the stat of choice for Axe, Katana and Odachi users. Each point adds HP in addition to Affinity to supplement the melee nature of these weapons. The HP it gives is half as much as the HP each point of Vit gives. Players who prioritize damage may choose to add Power as a secondary stat as it also gives P. Atk Spd in addition to bonus Affinity to all physical weapons every 10 points. Vitality raises the player's maximum potential defense capability, with raised Max HP and P. Def stats. Due to the defensive nature of the stat, it is also the Spear's primary attribute, allowing the user to take a lot of punishment. Some players opt for Vit as a secondary stat due to the high amount of Max HP it gives, allowing more room for mistakes. Wisdom helps when dealing magic damage with a Wand and increases the speed at which a magic skill is casted. It also encourages the usage of said skills by providing an abundant SP pool and high recovery rate to work with. In addition, it decreases the normally high SP costs of Wand and Staff skills, but not any other skills. As Wis provides a small amount of Critical, Critical-based characters may choose to add this as their secondary stat to boost damage output. Note that, unlike Dex, Wis only increases the rate of critical hits, but not their damage. Dexterity is the main stat of Bows and Twin Swords. Granting Critical, Critical Attack Bonuses, as well as Cooldown Reduction and Affinity, it can be considered the best DPS stat after a player has reached maximum affinity. Characters that add this as their primary stat are usually glass cannons. Due to the damage output that Dex can provide, some choose to add this as their secondary stat. The maximum amount of HP your character can have at one time. You die when it reaches 0. Is increased by Pow and Vit based on your character's level, scaling exponentially. Vit gives 2 times as much Max HP as Pow. Is given by: ( 1.01^(Level-1) * (100+(Level-1)*20) * (1+(Pow+Vit*2)/300) ), rounded down. The Rate at which your character recovers HP, at an amount proportional to your Pow. Is increased by your Vit. The maximum amount of SP your character can have at one time. Your character expends SP to use skills. You can't use skills if you have insufficient SP. Is given by: (1.01^(Level-1))*(100+(Level-1)*2)+(Wis/2+Mnd)^1.2, rounded down. The rate in which the player regains SP when guarding with a staff or wand. Is increased by your Wis primarily and Mnd secondarily. A value used to calculate how much damage your character deals. Uses your weapon's maximum damage when calculating the Attack value in your status screen. Additional attack will increase a player's damage in a non-linear fashion. That is to say, a 10% increase in attack will provide more than a 10% increase in damage. Your character's resistance to physical damage. Suffers from diminishing returns, although the damage you receive presumably scales linearly with your Defense. Your character's resistance to magical damage. The percential chance of inflicting a critical blow. The innate amount of critical you have is 5. The amount of critical you have is calculated as 5 + Dex/12 + Wis/24 truncated (rounded down). The character's capability to equip magatama depending on its chakra weight. Depends on the character's level and Amaterasu's Nigimitama level. BONUS DAMAGE STAT: Usually a percentage to give chance for a certain element deal bonus damage or exceeding cap damage *9999999 cap* in a certain max bonus it can deal * for example X weapon have 1.5 m break cap bonus that mean max bonus damage it can deal is 1.5 m * the element bonus increase by how many element that you have on the build. The more elemeent you have, the more bonus damage that u can deal up to the max bonus*. This damage will ignore enemy element resistance. 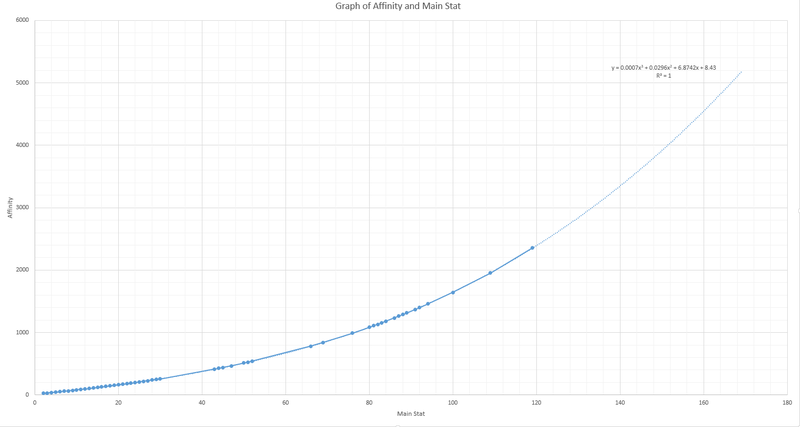 A Graph showing the correlation between main stat and affinity. Does not include Pow Bonuses for obvious reasons, and the formula shown is not 100% accurate, so be careful of errors if using it to calculate extremely exact values. The full graph will be uploaded to the wiki once more values have been obtained. Affinity is maxed at 3000 up to and including level 100. From levels 101 to 110, the player gains 100 affinity per level for a max for 4000. From levels 111 to 115, the player will gain 400 affinity per level for a max of 6000. Adding more status points after Affinity is maxed does not increase damage anymore. In the photos, I have a bow equipped. As you can see, the Twin Sword Affinity increased when I added DEX, but the Bow Affinity and Attack didn't increase because it's Affinity was already maxed. (1.01^(main stat -1))*(20+6*(main stat -1)) rounded down. Pow affinity bonuses are then added if applicable. Fire: Fire is an element that attempts to immolate its targets, inflicting smalls bursts of damage over a few seconds. Shorter duration but more damage per tick in comparison to poison. Ice: Ice can freeze its target, impeding all of their actions for a few seconds. Lightning: Lightning zaps its targets with electricity which may cause paralysis and negate its targets' ability to attack or cast abilities. However, they can still move despite the constant flinch animation. Rain: Rain inflicts water damage. Mountain: Mountain inflicts earthly damage. Wind: Wind deals damage using the speed of the wind. Holy: Holy strikes with heavenly energy. Dark: Dark based abilities are evil in its ways, often sacrificing a part of the caster's stats in their use. Slice: Slice, as its name indicates, is an attack where a blade cuts the enemy. Slice is often used by Axe, Odachi and Sword. It is occasionally used by Twin swords and spear, and rarely used by other weapons. Impact: Impact, as its name indicates, is an attack that uses brute force to inflict blunt damage. Twin swords use this attack style for many of their skills. Wand and staff use this attack style for their basic attack combos. Pierce: Pierce, as its name indicates is an attack that attempts to stab the enemy with a sharp attack. The bow and spear are the weapons that often offer this kind of attack style. Poison: Poison is a specialized element that injects poison into its target, inflicting damage over a span of time. Longer duration but less damage per tick in comparison to fire. These Elements were previously used in the game but have since been removed. It was speculated that they had no effect during the time that they were implemented and are now displayed as "[Effect Does Not Exist]". Flight: Flight damage is a rather unique elemental. It is not known which weapons offer this type of element. It is speculated to promote damage that is caused by charging or jumping (Exa: the Daruma's leap attack). Multihit: Multihit is similar to flight element in that not much is known about it. It does exist, however, as players can identify weapons that give bonuses to the multihit element. Many monsters will also resist multihit. Hidden stats are statistics that are not directly visible in numbers within the game, but do play a role in the gameplay. Note that the initial bonuses you receive at Lv1 are your base stats, which can be increased by status points, while the bonuses you receive through leveling up are additional stats, shown after the + in your status screen.